In 2008 Artist Lisa Scholder, with the assistance of film producer Jim Webb of The Webb Works, hand painted her first breast Cancer Survivor. The overwhelming response of her experience inspired Faces of Courage founder, Peggy Sherry, to collaborate with Lisa Scholder and Jim Webb to develop this into a “Healing Arts Project” which became Bodies of Courage and a subsidiary of Faces of Courage in 2010. Faces of Courage, is a 17 year non profit 501(c)3 organization located in the Tampa Bay area that has served over 8,000 families by offering FREE CAMPS & EVENTS that are fun and non-judgmental to men, women, and children with cancer and blood illnesses. To date, 49 Cancer Survivors have been painted, and the gallery of their photos has become a powerful expression of strength and beauty in survivorship. Each day thousands of women are diagnosed with breast cancer. To honor those survivors and promote hope to those suffering with the disease visionary artist Lisa Scholder created beautiful works of art which comprise the Bodies of Courage Collection. 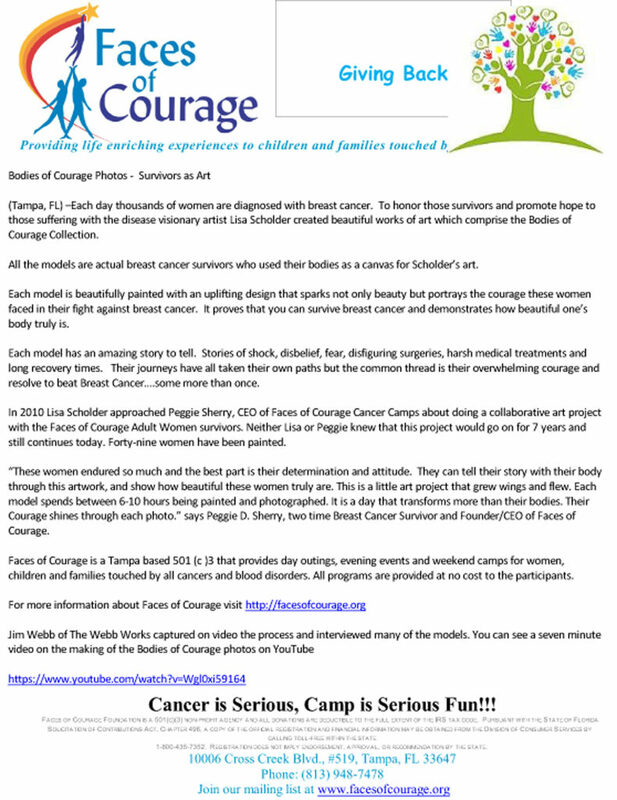 In 2010 Lisa Scholder approached Peggie Sherry, CEO of Faces of Courage Cancer Camps about doing a collaborative art project with the Faces of Courage Adult Women survivors. Neither Lisa or Peggie knew that this project would go on for 7 years and still continues today. Forty-nine women have been painted. “These women endured so much and the best part is their determination and attitude. They can tell their story with their body through this artwork, and show how beautiful these women truly are. This is a little art project that grew wings and flew. Each model spends between 6-10 hours being painted and photographed. It is a day that transforms more than their bodies. Their Courage shines through each photo.” says Peggie D. Sherry, two time Breast Cancer Survivor and Founder/CEO of Faces of Courage. Faces of Courage is a Tampa based 501 (c )3 that provides day outings, evening events and weekend camps for women, children and families touched by all cancers and blood disorders. All programs are provided at no cost to the participants. Jim Webb of The Webb Works captured on video the process and interviewed many of the models. Cancer is Serious, Camp is Serious Fun!! FACES OF COURAGE FOUNDATION IS A 501(C)(3) NON-PROFIT AGENCY AND ALL DONATIONS ARE DEDUCTIBLE TO THE FULL EXTENT OF THE IRS TAX CODE. PURSUANT WITH THE STATE OF FLORIDA SOLICITATION OF CONTRIBUTIONS ACT, CHAPTER 496, A COPY OF THE OFFICIAL REGISTRATION AND FINANCIAL INFORMATION MAY BE OBTAINED FROM THE DIVISION OF CONSUMER SERVICES BY CALLING TOLL-FREE WITHIN THE STATE 1-800-435-7352. REGISTRATION DOES NOT IMPLY ENDORSEMENT, APPROVAL, OR RECOMMENDATION BY THE STATE.